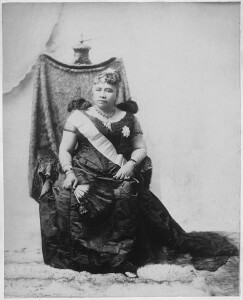 Lydia Kamakaeha was the sister of David Kalakaua, who was chosen king of Hawaii in 1874. When the heir apparent, Kalakaua’s brother, W.P. Leleiohoku, died in 1877, Lydia became heir presumptive and received her royal name, Liliuokalani. She ascended the Hawaiian throne in January 1891, when King Kalakaua died. The first woman to reign over Hawaii, she was also the last Hawaiian sovereign. Sanford Dole, the American-born head of the Missionary Party, asked her to abdicate in January 1893. When she refused, he simply declared her deposed, created a provisional government, and sought annexation by the United States. To avoid a civil war, Liliuokalani stepped down, but appealed to President Grover Cleveland to restore her. Cleveland gave the order, but Dole refused to obey it. A royalist insurrection erupted but was quickly suppressed, and on January 24, 1895, in exchange for pardons for her jailed partisans, the queen formally abdicated. She continued to fight U.S. annexation, which came nevertheless in July 1898 —the very year in which she composed “Aloha Oe,” the most familiar of all Hawaiian songs.